Islam making major inroads in the east African nation. China pumping millions into infrastructure and industry. An Italian reporter gauges changes in the former colony. ADDIS ABABA — On the flight from Rome to Addis Ababa, the Ethiopian capital, flight attendants hand out Chinese-language magazines. And in the city's Bole International Airport, the only cigarettes available are of the made-in-Chinese variety. Marlboros aren't an option. Outside the airport, at the first traffic light, my taxi jockeys for position with a economy car driven by a man who appears to be Chinese. "Since they began arriving a few years ago I see them everywhere," my Ethiopian taxi driver complains. "We used to call white people ferenji, which means foreigner, but now we mainly use it for the Chinese. They built everything here: the African Union (AU) headquarters, the new light rail system, the Modjo-Hawassa highway, even the railway to Djibouti." Here in Ethiopia, where the Italian Empire went to ruin in the ashes of World War II, China is building a new empire of its own. Heading out from the capital of one of Africa's fastest-growing economies, another feature of the landscape catches the eye. A minaret soars over every urban center, community, or village that appears in the distance — many have even more than one. "Those are all financed by oil money," the driver explains. "For the last 20 years Saudi Arabia, Qatar, and Kuwait have been building mosques here." It doesn't take long upon arriving in Ethiopia to understand the forces at play. While China builds roads and highways in exchange for access to the country's lucrative natural resources, the monarchies of the Arabian Gulf establish their influence in rural areas by building mosques and spreading Sunni Islam. Journalist and Africa expert Howard W. French says that Chinese "neocolonialism" began in Ethiopia about two decades ago, in 1996. That year, in a visit to Addis Ababa, then-Chinese President Jiang Zemin proposed the establishment of the Forum on China-Africa Cooperation (FOCAC). Upon his return to China, Zemin urged industrialists to invest in Africa. Since then the Chinese presence on the continent has grown and become ever more visible, with Chinese-built roads, railroads, and industrial hubs popping up across Africa. Buckling under the pressure of a food crisis and an influx of refugees escaping long-running instability in the Horn of Africa, the Ethiopian government sold the country's best land to Chinese investors, who used it to produce grain for export. The new railway linking Addis Ababa to the port of Djibouti, 750 km away, grants the landlocked nation access to the sea and was built by the China Railway Group (CREC) and the China Civil Engineering Construction Corporation, a subsidiary of the China Railway Construction Corporation (CRCC). The three-lane Modjo-Hawassa highway, at a cost of $700 million, is also being built by the Chinese, as was the $500 million light rail system that cuts through Addis Ababa's traffic. The two-line system is the first to be built in sub-Saharan Africa. But Beijing isn't solely interested in business investments on the world's second-largest continent. China is building its first overseas military base in neighboring Djibouti, which will include an air force base, lodging for thousands of soldiers, and a deep-water port that can host large warships. The expropriation of land for these projects has run into intense opposition from local tribes in Ethiopia. Last summer, protests erupted across Oromia, the country's largest and most populous region, spurring a brutal crackdown that killed thousands and forced the regime to declare a state of emergency. "The fear now is that protesters and farmers will see radical Islam as a source of hope against the Orthodox Christian elite that rules the capital," says a youth who asks to remain anonymous. Other Ethiopians claim they have never seen so many imams and people wearing the Islamic veil as they do now. 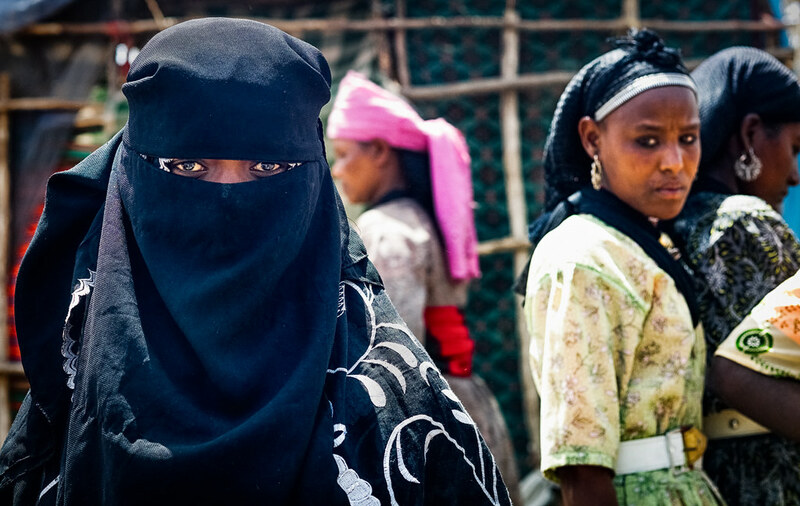 Ethiopia has ancient ties to Islam and was the site of the first ever hijra — the journey undertaken by the prophet Muhammad's earliest followers to escape persecution in Mecca. It is also home to Negash, the oldest Muslim settlement in Africa. Experts claim that despite this long history, the Gulf monarchies embarked upon a targeted "Islamization" of the country after the fall of the Soviet Union and Ethiopia's communist dictator Mengistu Haile Mariam in 1991. This was done by building mosques in Muslim-majority areas and spreading their version of the Sunni faith in Islamic schools. "In 1991 Riyadh took 2,000 young Ethiopians to study the Koran in Saudi Arabia, sending them back as imams two years later," says an anonymous source. "That's when burqas and minarets began to appear everywhere, and the Gulf monarchies want to build two mosques for every community." While China focuses on business interests, the Arab states seek to indoctrinate ordinary Ethiopians. Ethiopia has one of the highest population growth rates in Africa and is projected to reach 210 million people in 2060, up from the current 99 million. Their goals and tactics vary. But Beijing and the Arabian Gulf both see Ethiopia, whose global importance will only continue to grow, as an area full of promise.